The firm said no other alternatives offered a "sustainable solution"
A cooker factory in Staffordshire is to close with the loss of more than 600 jobs. 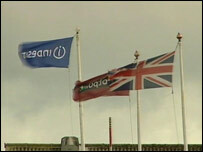 Indesit said production at the former Creda plant in Blythe Bridge will move to the company's existing facilities in Poland and Italy. The 619 workers to be made redundant will leave between mid-September and the end of the year. The announcement confirming the closure follows a 90-day consultation with trade union representatives. The company said no other alternatives to closing the site offered a "sustainable solution". Carlos Ramos, UK manufacturing director for Indesit Company, said: "Through the discussions with Trade Union representatives, it has become clear that it will not be possible to continue activities on the site. "This has been a very difficult period, throughout which the company recognises and appreciates that the Blythe Bridge workforce has demonstrated commitment and a professional approach at all times." The firm said its priority is to fully support all workers, through initiatives such as job clubs and additional skills training. The agreed redundancy terms will now be discussed individually with each affected employee, it added.